Over the past week, the music world has been an eventful one to say the least. 2014 may have gotten off to a slow start, but this year has been the exact opposite, with a slew of high-profile tracks being released in January alone. Artists like Joey Bada$$ and Lupe Fiasco made major waves, while acts such as Freddie Gibbs and Ghostface Killah, among others, held the ‘net down with random heaters of their own. The first week of February has come and the music keeps coming at a rapid, but a few records out of the endless pile of new releases managed to pique our interest and stand a cut above the rest. We present our latest edition of Songs of the Week with three tracks from Big Sean, Ne-Yo and Migos. Did your favorite tune make the cut? Let us know in the comments below. 2014 was the year of Migos mania. 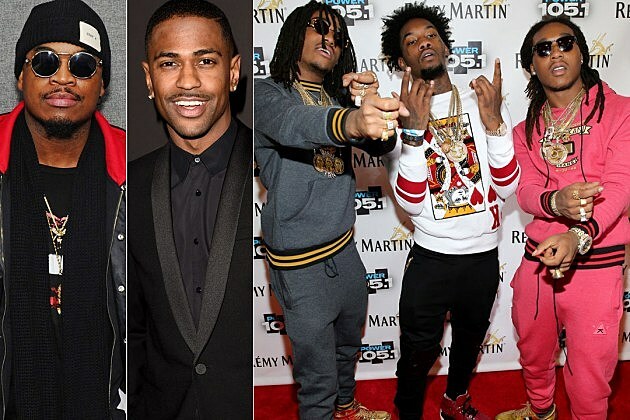 Remaining omnipresent for the duration of the year due to hits like ‘Fight Night’ and social media word of mouth, Quavo, Takeoff and Offset evolved from a trap group on the fringe to the cream of the crop. Looking to expand their brand, Migos are set to release their major label debut this coming spring. We got our first taste of what we can expect from ‘Y.R.N. : The Album’ this week when Migos released the album’s lead single, ‘One Time.’ This is a high-quality banger primed to dominate the rest of winter, spring and beyond. Ne-Yo has had a fantastic year so far. Releasing his sixth studio album, ‘Non-Fiction,’ in late January, the LP debuted at No. 5 on the Billboard 200 and has garnered much critical acclaim and put Ne-Yo’s music back in the spotlight. This week, he unleashed the remix to his smash hit, ‘She Knows,’ enlisting the help of fellow singer-songwriters The-Dream, Trey Songz and T-Pain for an eventful R&B posse cut. Produced by Boi-1da and Vinylz, the track is ominous and grabs your attention immediately. All three MC’s drop stunning verses full of crotch-grabbing slick-talk and boastful proclamations, resulting in what may be the biggest pure rap song of the year so far. As the year moves along, you can expect this track to get plenty of burn in the clubs and on radio, setting the stage for what will be a very G.O.O.D. year.